HOTweezers® represents the state of the art in design and construction of thermal wire strippers. The hand unit is shaped like a pair of cutoff tweezers and weighs less than 2 ounces (57g) including cable and connector. Because of this, the HOTweezers® Thermal Wire Stripper fits comfortably in the users hand, and the wire stripping operation is smooth and natural. The small size and light weight have proved in production use to be very effective in increasing output and reducing operator fatigue. 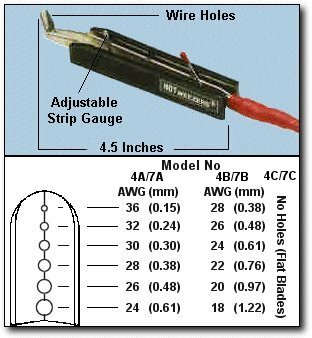 For more information regarding the HOTweezer® Thermal Wire Strippers, please visit the links for both the Standard (4* Range) and the Anti Static (7* Range) HOTweezer® Thermal Wire Strippers at the bottom of the page under 'related products'. We have a wide range of refurbished standard HOTweezer® Thermal Wire Strippers (4* Range) and also the Anti-Static HOTweezer® Thermal Wire Strippers (7* Range). We also have the M10 Power Supply Unit for the 4* Range and the M20 Power Supply for the 7* Range also available. Please contact us regarding availability.